I recently posted this on LinkedIn and felt this was also a good place for this. Well, I just passed the 4th and final certification exam that Magento offers. I just did a quick search and there are a total of 6 of us in the United States, and 35 world wide who decided to take all 4 exams. After this year of studying and preparing, its a very good thing for any Magento developer to strive to do. It forces you to fully understand the platform as whole. For the past year, due to a lack of actual titles for Magento developers ( other than certification levels ), I was calling myself a Magento Architect. I first heard the term when I worked briefly for Classy Llama. They needed, after I started of course, more of a backend/front-end developer who can follow layouts that were provided. My brain, of course, was not on the same page. I was a very strong developer who typically runs entire projects. I could do front-end but am much better with extending its functionality. After doing some mobile theming I had to conduct a short interview, and it they said they liked me, but they did not have a need for an developer of my style. They said that my skills were more of an architect but I did not have the ability yet to be used in that capacity. Of course, I was crushed. I had read many of the blog posts Classy Llama has published regarding Magento development. I still look up to that agency as a premier company that does awesome work. I wanted to be a part of such an organization. After that encounter, I felt that I should be able to call myself a "true" Magento developer and take that certification exam. Keep in mind, I am in my early 40's and my last test/class/exam/study session I did was 20 years ago. That spring ( 2014 ), after a few weeks of studying, I took the test one morning. Ifailed. Wow, what a huge disappointment. I get cut from an agency in January, and fail the Magento developer certification exam. I had thought for a moment that perhaps they were just being nice, and saying I had potential to be an architect. I really did not know what I wanted to do. I had been using Magento for my only development for 2+ years now every day on many projects. I thought I knew the application. Apparently not. Later that year, in the fall, I took the exam again, after trying to prepare again on my own....once again fell just short of passing! I was actually upset this time. I thought I had studied enough. That was the day I realized I was a user of Magento, not a developer, let alone an architect or anything close. Obviously I could not study the right material on my own. However, after taking it 2 times, I had a good idea of the types of questions and started to build my list of questions I have seen and remembered after the test was done. I decided to take the Magento Certification Study group. This made a world of difference. I met some really good people there, Karen K. and Herve T.. They are both people I still chat with today. Once that class was done, I took the Magento Developer test and passed! Woot Woot! Every few months I would take another exam, the Front-End developer I had to take 2 times. It was harder than I thought it would be! CSS3 is pretty cool, now that I understand how it works. Each exam takes a section of the Magento platform, and tests how much you truly understand it. The topics and questions asked try to prove that you have a FIRM grasp on the topic. So, as of Aug. 20, 2015, I have all 4 certifications, I am very very very happy I can stop studying! Most of all, I can finally say I understand Magento, I appreciate the platform, and can say I am a darn good developer. If Magento would hand out titles, I would hope that they would call me a Magento Architect, heck even Magento Engineer sounds ridiculously awesome. I may use that one. 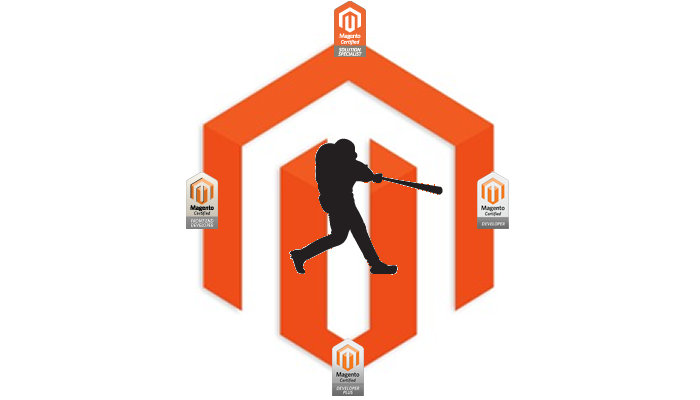 I just got the Magento Grand Slam, all 4 certifications. Magento Developer, Front End Developer, Solution Specialist, and Developer Plus. I would love to inspire all developers out there to go for it. Its worth the effort. You will be proud of yourself. It is well worth the effort, even if it only validates your training and experience. You should also take the group study. There are some really interesting people out there and you will make some great friends. To all the folks at Magento, thank you for pushing this platform and making it a pretty darn awesome one. I am excited and nervous about Magento 2, only because I will have another year of study ahead of me preparing for more certifications!